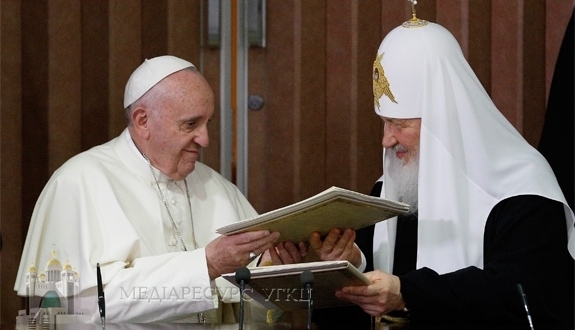 Francis and Kirill: Who Played Whom? Five details from yesterday's historical meeting suggest that while the Russian Patriarch may have thought he was first violin, the Jesuit Pope was conducting the orchestra. Pope Benedict XVI was, and is, known for playing the piano. Russian Orthodox Metropolitan Hilarion Alfeyev, the chief architect of Friday’s Cuban summit between his boss Patriarch Kirill and Pope Francis, is a published composer of sacred music. But what about Francis himself? What are his musical talents? After his visit to Cuba today, I cannot help but wonder: does Pope Francis secretly play the fiddle? More than one of my Orthodox friends (and not a few of my Ukrainian Catholic friends), in commenting earlier this week before the Cuba summit between the pope of Rome and the patriarch of Moscow, voiced the worry that Francis would get “played” by Patriarch Kirill—that he would walk into a Russian trap. Having read the statement of the Cuban summit, there are indeed parts of their joint statement that read very much like it was drafted solely by and for the Russians who, I have no doubt, will shamelessly spin it to suit their agenda. But I wonder. I wonder if Francis will not be happy to have the Russians make such claims in the months ahead. I wonder if the Russians, thinking they have “played” the pope, have not unwittingly found themselves pulled into an orchestral arrangement in which they are simultaneously first and second violin, simultaneously both composers and, more important, players alongside others they cannot totally control. I wonder—to use a famous Russian formulation attributed to Lenin—who played whom? This statement, then, admits of more than one reading, more than one hearing. Patriarch Kirill may have thought he was first violin, and perhaps he was at points; but it is not at all clear to me that Pope Francis was only second violin the whole time. Consider, in witness of this, four examples from the joint papal-patriarchal statement from Cuba, and a fifth from the meeting itself. It is my contention that all of these compositions are composed in such a way as to admit of hearing in two quite different ways. First, paragraph 24 says of Catholics and Orthodox: “We are not competitors but brothers.” Many Catholics, perhaps most Catholics, and certainly most Russian Orthodox, will read that and think it’s aimed at Catholics, who are always (so the Russians claim) engaging in this competitive sheep-stealing “proselytism” condemned in the line immediately before this one. But the statement can also be read—and I would argue very much should be read—not as a rebuke of Catholics, but as a quiet and wholly necessary reassurance to Russians. For it is Russians who need to be assured, again and again, that Catholics in Ukraine, Russia, and elsewhere are not there at Orthodox expense, and that any growth in Catholic numbers is not a defeat for the Orthodox, but a common victory for the Gospel of our common Lord. This statement says, in effect, we must no longer conceive of our relationship as a zero-sum game: Orthodox lose if Catholics win converts, or vice versa. If Catholics grow in Ukraine or Serbia or Russia or Greece: to God be the glory! And if Orthodox grow in Quebec or Palermo or Vienna or Dublin: to God be the glory! According to both Catholic and Orthodox teaching, a person entering into either Orthodoxy or Catholicism has access to “valid” sacraments and thus all the means necessary to salvation. So we can and should be united in rejoicing at each other’s gains, and united again at mourning each other’s weaknesses and losses. Today: This can and should be read as meaning that nobody in 2016 is looking to create another Eastern Catholic Church out of an existing Orthodox ecclesial community. And indeed nobody is doing that. Rome has twice now foresworn off any future “uniate” churches. But the “today” is key here, I’d suggest, insofar as it cuts off any kind of retroactive rubbishing of the past, any kind of apology (cf. my “Apologia Pro Unia”, Feb 8, 2016) for what happened yesterday, or at any point in the past. “Today” closes the door to the past and prevents us from indulging in that infuriatingly jejune practice popular among spoiled students of dragging up the dead to condemn them for insufficient sensitivity to today’s politics—whether it’s Columbus, Junipero Serra, or the leaders of the Fourth Crusade. In other words, Eastern Catholics exist, and neither they nor Rome are prepared to condemn them and apologize for their past existence. In this context, however, “ecclesial communities” is used to refer to one-time Orthodoxbodies who happened to became Catholic. This phrase, then, also admits of a dual reading—it can be read as applying in a denigrating fashion to today’s Ukrainian CatholicChurch; but it is first posited of the Church of Kievan Rus, which is Orthodox and whoseOrthodox bishops took themselves to Rome in 1595 to negotiate the Union of Brest. This must not be forgotten! But, fourth, perhaps the most important phrase is this, again from paragraph 25 when, in speaking of Eastern Catholics, it says they have the right to exist and to undertake all that is necessary to meet the spiritual needs of their faithful. After a quarter-century of unrelenting hostility from the Russians directed against Ukrainian Catholics, it is no small thing for them to finally concede in print that we have a right to exist. Now, to be sure, and following Churchill’s famous phrase from 1940, I do not consider this the end, or even the beginning of the end, of Russian hostility and complaints about “the uniates.” But this statement is, perhaps, the end of the beginning phase in the propaganda war, which has lasted twenty-five years now. Consider, fifth and finally, the very fact of the meeting itself. Having for so long held the prospect of a papal-patriarchal summit hostage to its own demands, the Russians can hardly return to doing so now. They sought this meeting because they clearly need it to boost their badly battered standing in both the international political and ecclesial arenas thanks to their war against Ukraine, their involvement in Syria, and their incessant campaign to shove the Ecumenical Patriarch into the Bosphorus. They got the meeting they wanted, and they got the statement they felt they needed. But so did the pope—on both scores. There is a reason that the Jesuits were exiled in 1820 from Russia by Tsar Alexander I. There is a reason the Jesuits have long struck terror in the hearts of Russians and others. There is a reason that to call someone (whether a member of the Society of Jesus or not) “Jesuitical” used to be an accusation of the slipperiest, slyest, most casuistic forms of argument that could be read one way or another. You have to hunt high and low to find Jesuits like that today, but I think one has been hiding in plain sight all along in Casa Santa Marta in Rome, happily playing second fiddle while others wrote and attempted to take sole credit for the composition, and also insisted on conducting it themselves. Well played, Francis, S.J. Dr. Adam A. J. DeVille "The catolic world REPORT"